I’ve mentioned before that I am not much of a breakfast eater. I value my sleep too much and stay up too late to realize my grand visions of pancakes and cinnamon rolls first thing in the morning. 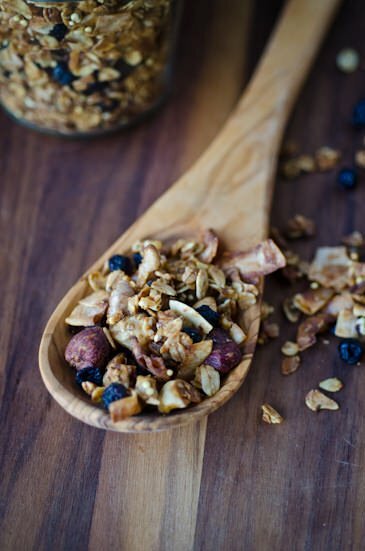 I require something that I can have on the table in 5 minutes or less, that’s why granola is a perfect food to help me ease into my day. 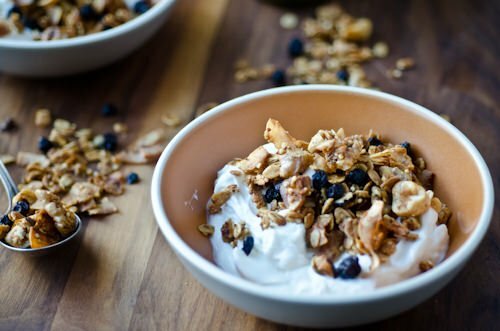 This is a lighter version than most since it uses an egg white in the mixture which allows you to significantly reduce the amount of oil yet it still delivers a great crunchy granola. This is a super adaptable recipe and you can customize it to suit your taste. Try swapping out the honey for maple syrup or agave. Don’t have dried blueberries? Use cranberries or cherries. 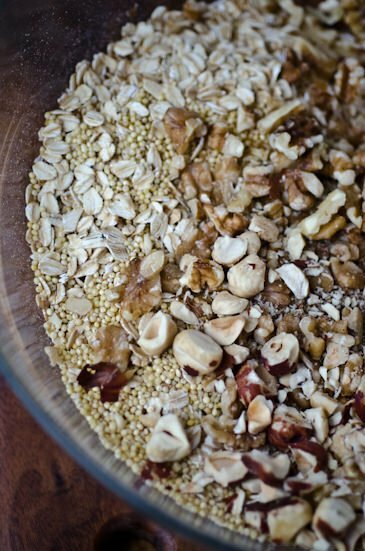 You can easily omit the millet or hemp seeds but they add great texture and nutrition. 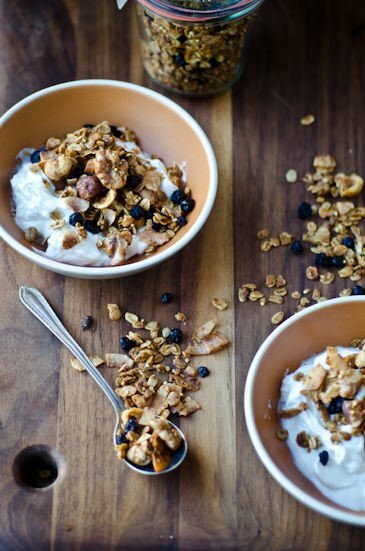 How do you like your granola? I’d love to hear some of your favorite flavor combinations. In a small saucepan heat the honey, coconut oil and brown sugar together until warm. Scrape the vanilla bean into the pot and let cool slightly. In a large bowl toss all the ingredients except for the blueberries together. Lightly beat the egg white and add to the mixture along with the honey and coconut oil syrup. Spread the mixture onto a rimmed baking sheet. 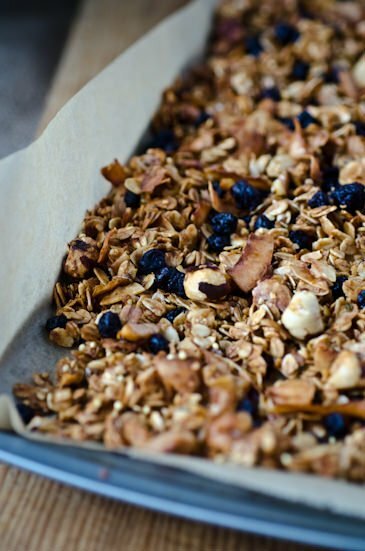 Bake granola, stirring every 10 minutes, until golden brown and dry, 40 – 45 minutes. Let it cool on the baking sheet. It will crisp up as it cools. Mix in the blueberries and serve.